Certified. 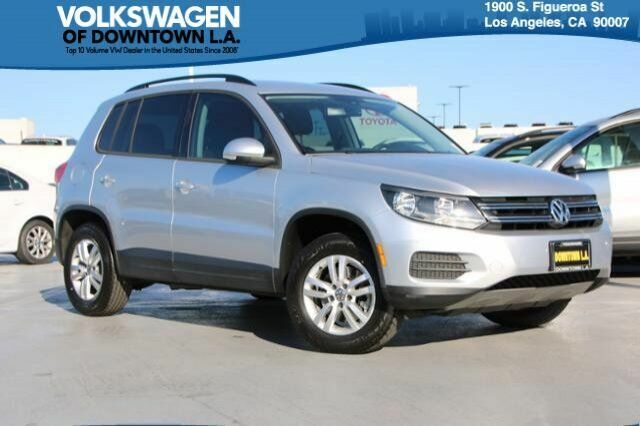 Reflex Silver Metallic 2016 Volkswagen Tiguan S MULTI POINT SAFETY AND MECHANICAL INSPECTION PERFORMED BY CERTIFIED TECHNICIAN, NEW FILTERS, FRESH OIL CHANGE, NEW TIRES, NEW WINDSHIELD WIPERS, DETAILED INTERIOR/EXTERIOR FOR DELIVERY, Volkswagen Certified Pre-Owned, Bluetooth Hands Free, GREAT VALUE, 4D Sport Utility, 2.0L 4-Cylinder Turbocharged, 6-Speed Automatic with Tiptronic, Reflex Silver Metallic, Charcoal Black w/V-Tex Leatherette Seating Surfaces, Alloy wheels, Exterior Parking Camera Rear, Heated Front Bucket Seats. CARFAX One-Owner. 21/26 City/Highway MPG Recent Arrival! FWD 2.0L 4-Cylinder Turbocharged 6-Speed Automatic with Tiptronic Clean CARFAX.